Lots of people are familiar with Troll’s psychedel-aquatic artwork, but fewer know that over the past decade he’s been leading one of Alaska’s premier musical acts. 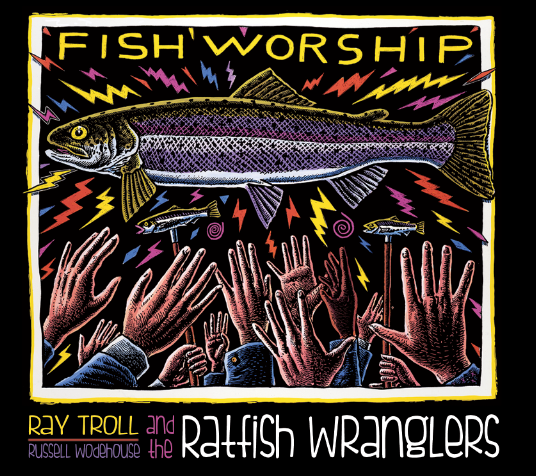 The Ratfish Wranglers are a confederation built around the trio of guitarist and vocalist Troll, multi-instrumentalist and singer Russell Wodehouse, and the inimitable Shauna Lee on backing and lead vocals. Lyrically, the group mostly focuses on three of Troll’s perennial fixations: fish, fossils and fertility, with a healthy dose of bad puns. Musically they’re all over the map, mixing and matching musical styles with no regard for whether or not they belong together. No sooner has this musically conventional if lyrically perverse song faded then it’s on to “Rockfish Recompression,” a mash up of hip-hop and ’80s arena rock that justifies throwing those unwanted fish back in the ocean (but without hurting them, please). “Megalodon” goes heavy metal with a tip of the hat to 1950s Japanese B movie horror flicks (the Blue Oyster Cult classic “Godzilla” is an obvious inspiration). “Some Something” has a 1980s Brit pop/ska sound, complete with a sax solo a la early English Beat. It’s the only song on the album Troll didn’t cowrite. “The Whorl” finds Shauna Lee taking lead vocals and evoking Grace Slick while the band noodles along like Jefferson Airplane with a techno beat. Fossils are the theme of “Whorl Tooth Sharks of Idaho” and “Time Traveling With a Shovel,” both of which are heavy on the country fiddle, although on the latter track the band manages to weave in another rap as well as a guitar solo worthy of a Van Halen b-side. “Snowmastadon,” meanwhile, could easily be a Spinal Tap outtake. The album continues along in this spirit. “National Rex” offers another rap: “Appreciation for biology / paleobotany / don’t be a wannabe.’’ Seriously. They rap this. “Karpinsky’s Lament” is a tango-waltz instrumental interlude, while “Hell Pig Ballad” finally slows things down. Only on the closing track, “Blues in the Key of Sea,” do things get serious with a lament for our dying oceans. It all works because while Troll provides the core vision, he lets his musical partners stretch out and stamp their own personalities on the proceedings. This is a full group production, with lots of guest artists adding to the zaniness. “Fish worship, is it wrong?” asks the opening track. “No, it ain’t wrong,” is the response. Neither is this album. Serve it up at your next fish fry. David A. James is a freelance writer who lives in Fairbanks.